New! 5/16/2009 - Version 1.09 Released! Gain Control of Your DTS Packages! Export results in CSV or XML formats. Did you ever break DTS packages with a database change? You're not alone! Many companies have hundreds or even thousands of DTS packages on multiple servers, and until now it's been nearly impossible to identify DTS packages impacted by a change. There's a solution. DTS Power Search allows you to quickly and easily search DTS packages on multiple servers at once. And not just simple searches either. You can do wildcard and even regular expression searches, as well as plain old text searches. A variety of reports can be printed out and search configurations and results can easily be saved for future reference. To really speed up searches (and take the load off database servers), you can export DTS Packages from multiple servers to a file path and just search the file path. This also provides a centralized repository for easy DTS package backups and source control. Download DTS Power Search today and see how well it works for you. It is a full featured 15 day evaluation. It runs on Windows 98 and above and requires the .Net Framework 1.1, which is likely already installed on your computer. DTS Power Search is truly a must-have tool for any shop which manages DTS packages. There's an unlimited, unconditional money back guarantee and unlimited upgrades for life. It doesn't get any better than that. 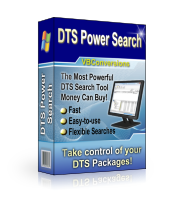 Download a Trial Version of DTS Power Search. No Obligation. No Registration Required. After reviewing and testing several DTS searching software packages, we decided to purchase DTS Power Search. It is hands down the best of class for DTS search engines.